: We can say with certainty that this breed is of the same origin as the other Balkan hounds. In the past this dog has sometimes been called « black hound ». The first standard dates 1924. The F.C.I. 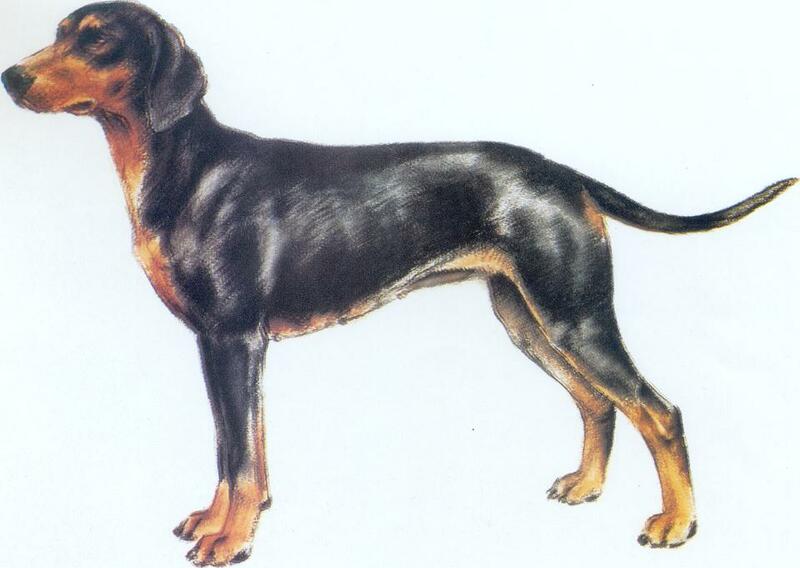 officially recognized this breed (standard N° 279) on the 8th May 1969 during its meeting in Warsaw. : Medium size, solid, agile. : The length of the body (measured from the point of the shoulder to the point of the buttocks) and the perimeter of the chest go beyond by about 10% the height at the withers. The length of the head corresponds to 45% of the height at the withers. : Well balanced, attached to his master, docile, trustworthy. : Dolichocephalic; the upper lines of the skull and the muzzle are divergent. : Longer than the muzzle; in the occipital region, its width is inferior to the distance between the stop and the occipital protuberance. Seen from the front and in profile flat or slightly arched. Its width decreases from the top of the skull down to the stop. The frontal furrow is accentuated, whereas the occipital protuberance is less obvious; the superciliary arches are well developed. : Always black, well developed. : Thick and broad at its base, is shorter than the skull. The desirable relation is of 7,5 10. The lateral lines of the muzzle are convergent. The nasal bridge is straight. : Moderately developed, tight, upper lip slightly overlapping the bottom lip; the corner of the lips is firm; the edge of the lips is pigmented black. : The jaws are strong and show a regular and complete scissor bite; a pincer bite is admitted. The teeth are well developed and regularly implanted. : Oval shape, placed slightly obliquely, of light to dark brown in colour; the rims of the eyelids are black. : High set, moderately long, thin to medium thick, pendant without folds and close to the head; their extremity is of a more or less pronounced oval shape. : Powerful, oblique, forming an angle of 45° to 50° with the horizontal. Its length is approximately equal to that of the head. It is thin, muscled and without dewlap. : Rectangular, its length going beyond by about 10% the height at the withers. : Muscled, broad, moderately long. : Muscled, solid, medium length, short coupled. : Slightly slanting (20-25° in relation to the horizontal), powerful, well muscled, broad. : Strong, deep; its depth corresponds to 45 to 50% of the height at the withers and its perimeter going beyond by about 10% the height at the withers. : The xyphoid appendix is prominent; the belly is only slightly tucked up. : It prolongs the line of the croup and goes on, thinning gradually from its set on to the extremity which reaches the hock; carried sabre fashion below the line of the back; is covered with abundant hair. : Strong, solid, muscled, parallel. : Shoulder-blade muscled, well attached to the thoracic wall; its length is approximately equal to that of the head; it forms an angle of 40 to 45° with the horizontal. : Solid, close to the body; the distance from the ground up to the elbow corresponds to 50% of the height at the withers. Pastern: Strong, thin, slightly slanting (up to 15° in relation to the vertical). : Cat feet; solid toes, tight, well arched; the pads are resistant, elastic and black; the nails are always black. : As the front feet. : Strong, muscled, parallel, of strong bone structure. : Strong, muscled, not prominent. : Solid, parallel to the median plane of the body; the angle of the stifle is of about 120°. : Its length corresponds approximately to that of the upper thigh. Muscled. : Solid, pronounced; its angulation is of about 135°-140°. : Regular and elastic stride, with good thrust from the hindquarters; the preferred gait is a lively and even trot. : Elastic, really tight to the body; shows a dark pigmentation. : Short, dense, rough, not very thick, glossy, flat, smooth. The undercoat is quite well developed. : The basic colour is black with tan markings above the eyes, on the muzzle and on the lower parts of the legs. The tan markings above the eyes are the size of a hazelnut, whereas the ones on the lateral parts of the muzzle extend at maximum to the corner of the lips. The colour of the tan markings goes from a light red through a brownish red to a bright red. A white spot on the chest is admitted but not sought after; its diameter must not be more than 3 cm. : The height at the withers is from 44-54 cm; the ideal size for the males varies between 49-50 cm, and for the females between 48-49 cm. Over- or undershot mouth; deviated incisor arch. Absence of one tooth, the absence of two premolars 1 (PM1) being tolerated. Eyes of a very light colour, wall-eyes, eyes of different colour; entropion, ectropion. Rolled up tail, carried above the back line or deviated laterally. Any other white marking than that which is tolerated. Superior or inferior size than that prescribed in the standard.